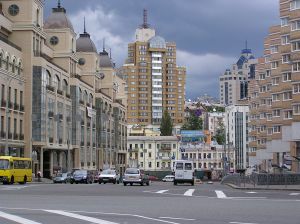 You are planning thoroughly your trip to Kiev, surfing the web for information on Kiev best sights, restaurants and attractions, and thinking how to plan your stay the best, what to see and where to go to. You are packing your new camera in order to make beautiful photos of golden domes, Khreschatik Street and Kiev parks. You are thinking what to wear and checking weather forecast for the days of your visit. In a few days or weeks you will get to another world with smiling people, ancient brick streets, monuments and cathedrals. Vladimir Mount - a park on the mount with large statue symbolizing Prince Vladimir with cross when he introduced Christianity and baptized Slavic people. Pervak restaurant - a medium-price restaurant located in 2, Rognedinskaya St. You can taste borsch and vareniks, small pies and various meat and fish dishes. The dinner will cost you about $30-50 per person depending on the food and drinks you choose. Taras restaurant - located in Shevchenko park near major Kiev Museums, close to Kiev University. You can order various pancakes as well as national cuisine dishes. The dinner will cost you $35-55. USSR restaurant - located near Kiev War Museum and Kiev Lavra Monastery in 42/1 Sichnevogo Povstannya St. and decorated with USSR symbolics. The dinner will cost you $35-55. Puzata Khata (Big Bellied House) fast food restaurant which combines original interior in peasant house style, tasty Ukrainian food, vast choice of dishes and low prices. It is located in very center, 1/2a Basseinaya St., in the beginning of Khreschatik. Here you can try traditional Ukrainian pampushky, Chicken Kiev, different salads and main courses. On the first floor you can also choose one numerous cakes and even order fresh made juice. The dinner cost is $3-10 per person. Zdorovenky Buly (Good Health to You) That's a very popular fast food restaurant located near Khreschatik metro station which probably has the largest choice of different foods: salad bar, pancakes, varenyky, pizzas, soups, tasty desserts. Its comfortable rooms are decorated in various styles: Chinese, Indian, Egyptian and Greek. It also has Tea bar with cakes where one can sit and talk. Dinner: $3-10 per person. You can buy various Ukrainian souvenirs on Andrew Descent (Andreevskiy Spusk): embroidered towels, matrioshkas, wooden painted plates and eggs, glass souvenirs, small dolls in national clothing, paintings and clothing. There is also a souvenir section in Kiev central magazine (Tsum), located in Khreschatik St and a souvenir shop near St Sofia Cathedral. Polina Kryuchkova runs a Advance-Tour travel company in Kiev, Ukraine. 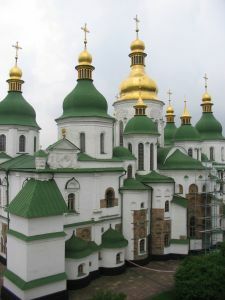 You can find more articles about Ukraine, travel tips, as well as information on accommodation, excursions in Kiev and Ukraine at the Visit Kiev Travel website.